This month (on the 10th to be precise) I will hit a 4 year anniversary. April 10 2001 I started writing a weekly column for ITWorld. The first one was called XML the syntax and the spirit. 4 years worth = (roughly) 50 weeks * 4 = 200 columns. Yikes. Without really realising it, I've written what amounts to another bookload of stuff. Looking back over them, I see some turkeys but most of them are such that I wouldn't disown them. I like this story (courtesy of Ryan Tomayaho) Insects and Entropy. I don't know how true it is but it rings true. It reminds me of Anatol Rapoport's 4-line BASIC program that tends to win Prisoners Dilemma tournaments. It also reminds me of Stephen Wolfram's A new kind of science. The big takeaway for me from that book was that after a threshold of behavioral complexity has been reached - a threshold you can get to with real simple algorithms - adding further complexity into the algorithms does not greatly increase the behavioural complexity of the resultant program. Finally (as I reach for more Coffee this bright Saturday morning after a sucessful April Fool Friday), it reminds me of Gregory Chaitin's Omega Number and the idea that algorithm "elegance" has a formal definition as the smallest program that will produce any given behavior. That is the essence of software engineering I think. Its not about writing cryptic programs to show how smart we as programmers are. Its about finding elegant forms of expression that maximimise our return on behavioural complexity while minimising the "moving parts" in the algorithms that generate that complexity. REST, SOAP, Speech Acts and the mustUnderstand model of SOA communications. There is a 99% chance that I will be at the next Python meetup in Dublin. My laptop, a Dell 5100, gets real hot when I leave it crunching 100's of megs of XML for extended periods. The fan puffs hard but not enough to keep the thing cool. In full throttle, you could fry an egg on the back of this thing. When the heat gets too much for it, the laptop spontaneously shuts down with no warning. No messages in the logs saying "too hot, I'm outta here". Nothing. This can be real annoying when you leave a machine running on some big data processing task overnight only to find out in the A.M. that it shut itself down at 12:30 a.m.. Anyway. I solved the problem by raiding (appropriately) the oven in my house. 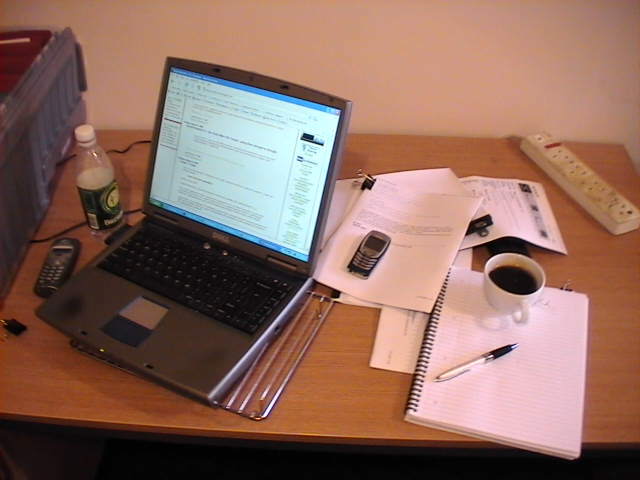 Note the indispensible domestic item under the laptop. Bandwidth - is this as good as it gets? is this week's ITWorld article. The title, [for once :-)], is self explanatory. What class of a thing is this type of URL? Is there a word for it? There should be. I was particularly giggled by the way Google Adwords immediately switched all adverts to Coffee theme when I rendered the URL.